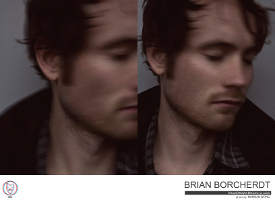 Since relocating to Toronto from his home in Nova Scotia more than 10 years ago, musician Brian Borcherdt has been able to introduce the world to two distinctively different musical personalities, a Jekyll and Hyde type of situation if you will. Perhaps the best known of these two personalities is the electro-rock combo Holy F#*k. Led by Borcherdt, the group has built a dedicated following throughout Canada, the US and beyond, performing at high-profile music festivals such as Lollpalooza and the UK’s Reading Festival, winning audiences over with their hypnotic rhythms. The other facet of Borcherdt’s career is the total antithesis to Holy F#*k. If that band is based upon layered, manic rhythms and improvisation, his solo work is comparatively bare-bones, thoughtful, and intimately introspective. Borcherdt’s latest solo work, Torches (The Ward Colorado demos), almost never came to be fully realized but through no direct fault of his own. It was New Year’s Eve 2008 and Borcherdt had wrapped up a New Year’s Eve performance in Chicago with Holy F#*k. Hailing a taxi to return to his hotel prior to heading to the airport for his flight home, his cab driver dropped Borcherdt off but failed to let him get an important piece of cargo out of the trunk prior to heading to his next fare. A suitcase containing more than three years of Borcherdt’s recordings was in the taxi’s trunk and all Borcherdt could do was helplessly watch as the cab sped away with his work. Speaking from his home in Toronto, Borcherdt says a nauseous feeling washed over him after the cab sped away. But like many other stories, this one has an eventual happy ending. Almost two weeks after leaving Chicago, the musician got a phone call stating that his suitcase had been retrieved and was on its way home to him. Once those recordings were back in his possession, Borcherdt vowed that he would not hold onto his recordings any more. Ironically, Borcherdt had been holding on to the once-lost recordings for such an extended period of time without releasing them as he didn’t quite know where they fit in the bigger picture of his music career. At the end of the day, Borcherdt is philosophical about his experience in Chicago and holding true to his word, decided there was no time like the present to get those formerly missing songs released. At the present time, the only way that listeners or those interested in Torches can get a copy is via Borcherdt’s website at www.handdrawndracula.com. The download of Torches is completely free for everyone – no strings attached. Borcherdt decided to go the route of the free download over the physical medium for the time being, to help avoid any further delay in getting the material out. “The medium now is more or less iPods and the internet anyway,” Borcherdt starts. “But funny enough, there was an initial negative reaction to this technology. Labels were worried about people getting their music for free; there is an outdated notion that artists should be holding onto their work and protect it from pirates and masses. “With Torches, I just wanted to do something conceptual and decided to release it and see what happens. In a way, I am curious to see what else I can do,” he says. With a new Holy F#*k record being completed and due to be released in April and the inevitable hectic tour schedule that will follow for the group, further solo material from Borcherdt might face a delay. Listening to the confidence and enthusiasm in his voice, you can’t help but get the feeling that Borcherdt is more than okay with that uncertainty.